New Zealand is a land of extraordinary contrasts, and no city encapsulates this better than Auckland. Urban yet blessed with natural beauty right on its doorstep, Auckland holds unique treasures waiting to be explored. From volcanoes and museums, black sand beaches and sensational cuisine, we’ve made hitting all the Auckland highlights easy. 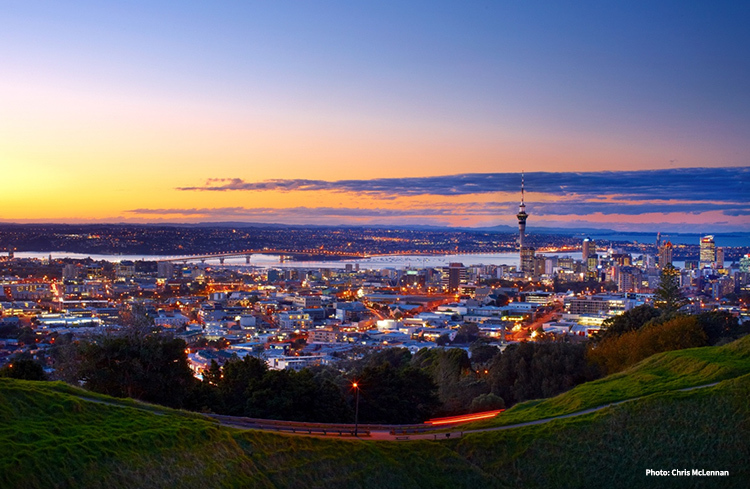 Here are 10 best things to do in Auckland for an unforgettable stay in New Zealand. Waiheke Island is all about shamelessly enjoying the good life. And you deserve it – you’re in New Zealand, after all! 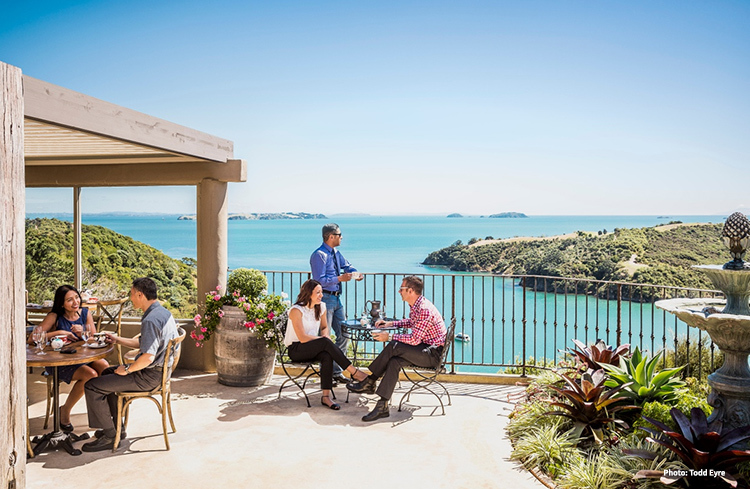 Dotted with sensational restaurants, endless vineyards, cellar doors and microbreweries, the culinary delights in Waiheke Island will tempt any palate. With a nick name like “Island of Wine,” wine-hopping in Waiheke is a must. Our favorite small-group winery tours stop at some of Waiheke’s top award-winning wineries with visits to hidden gems around the island. After delighting in oysters and champagne at Oyster Inn or a leisurely Italian lunch at Poderi Crisci, stop in at Island Gelato for a cool scoop of gelato with tasty flavors such as coffee affagato with roasted almond or mango lassi. Waiheke Island is also known for its strong art community. Scattered with galleries and sculpture parks, there’s a sense of creativity that mingles around the island, making all creatives feel at home. With such stunning natural beauty around the island, it’s easy to find inspiration everywhere you look. Surrounded in sparkling bays, inviting beaches, lush gardens and rainforest, if the wine hasn’t made you fall in love with Waiheke, its scenery definitely will. 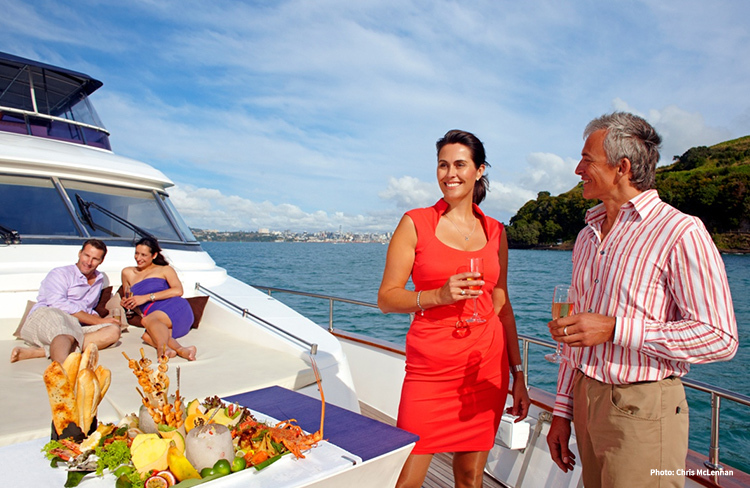 A ferry trip from Auckland to Waiheke Island takes about 40 minutes, with numerous daily departures and returns. You don’t need to travel far from Auckland to find iconic New Zealand natural beauty. In fact, a 25-minute ferry to Rangitoto Island will do. This volcanic island is the youngest and largest volcano in Auckland – it even looks like those perfect, symmetrical volcanoes you see in movies. Home to over 200 species of flora, native bird life and the world’s largest Pohutukawa forest, Rangitoto is a haven for hikers, daytrippers and nature lovers. 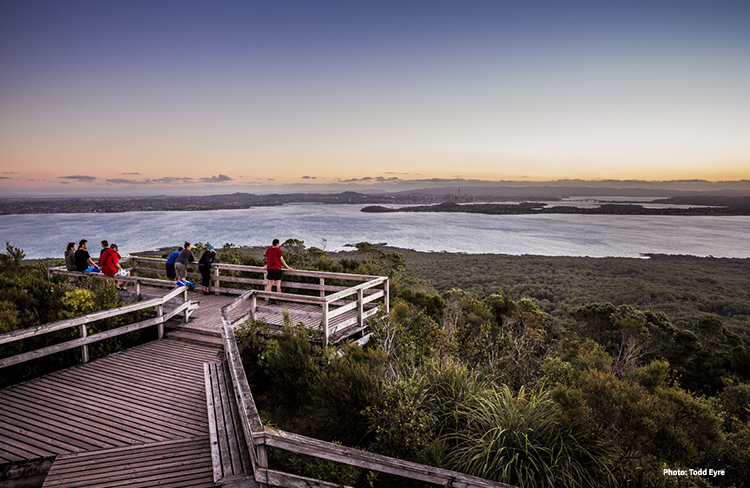 With walking trails strewn across the island, the most popular trail climbs the summit of Rangitoto. At the very top you’ll see incredible views over the emerald islands dotting the blue Hauruki Gulf, out toward Auckland city. There are seven lava caves to explore on the island, popular with families for a unique island adventure. Adventurous kayakers also like to brave the waters and kayak from Auckland to Rangitoto, a divine trek across the Waitemata Harbour where Little Blue Penguins and Cooks Petrels may be spotted. Not only rated as one of the top things to do in Auckland, the Auckland War Memorial Museum is also one of New Zealand’s finest museums. Here you’ll find incredibly rare Maori and Pacific Island treasures, natural history exhibits and cultural artifacts all telling the story of New Zealand as a nation. Housed in an elegant and imposing heritage building, you could easily spend hours roaming the unique collections within its multiple levels. 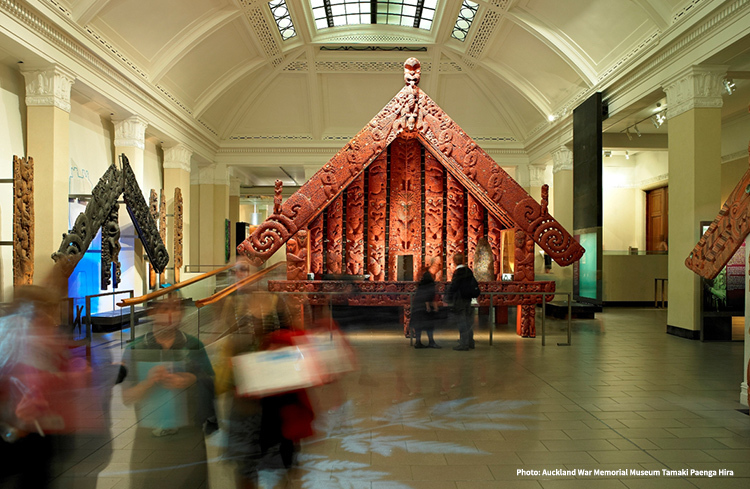 Explore the worlds of the Maori, Pakeha and people of Oceania on the ground floor. Stroll through the corridors of Maori carvings, canoes, jewelry, ceremonial objects and other Pacific masterpieces. On the first floor you’ll find life-sized replica skeletons of cryolophosaurus and malawisaurus dinosaurs that once roamed New Zealand. Discover other prehistoric treasures such as the now extinct 9-foot tall moa bird and other fossilized lifeforms. Wander up to the war memorial galleries for historic aircraft, photos, diaries and military collections uncovering New Zealand’s unique war history. 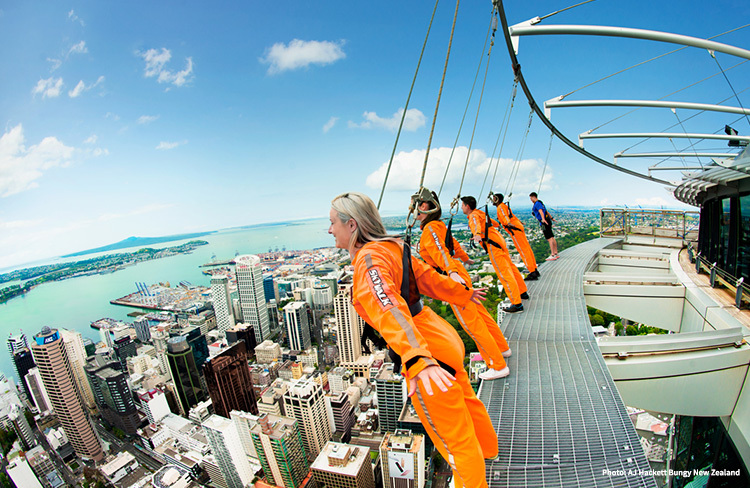 Feel the rush of adrenaline pump through your veins as you climb to the top of the Auckland Sky Tower. Standing at 1,076 ft (including the antenna spire), it is the tallest freestanding building the Southern Hemisphere, an iconic feature of the Auckland city skyline. As one of Auckland’s most popular attractions, the tower holds something for every visitor. Its main observation deck on level 51 features a glass floor as thick as concrete, offering visitors incredible views of Auckland below. Treat yourself to the wonderful 360-degree views and delightful degustation menu at The Sugar Club on level 53, a feast for the senses surrounded by a splendid art deco ambience. Here on level 53 is where daredevils take on the SkyJump, a 630 ft guide-cable-controlled jump where divers may reach speeds up to 53 miles per hour. What a perfect level to jump from! For those with a taste of adventure but not exactly looking to jump off a building, inch along a narrow walkway around the tower on the SkyWalk. Guided by experienced climbers and safely attached with a harness, this exhilarating challenge will get your blood pumping as you stand at incredible heights, enjoying unobstructed views across Auckland. New Zealand is framed with many stunning beaches, and Auckland adds its own gems into the mix. Its famous black sand beaches on the west coast are about an hour’s drive away. Possibly the most famous and most accessible black sand beach is Piha, a black iron sand beach popular for surfing. Other black sand beaches include Karekare, Muriwai, Ngarunui and Hot Water Beach. 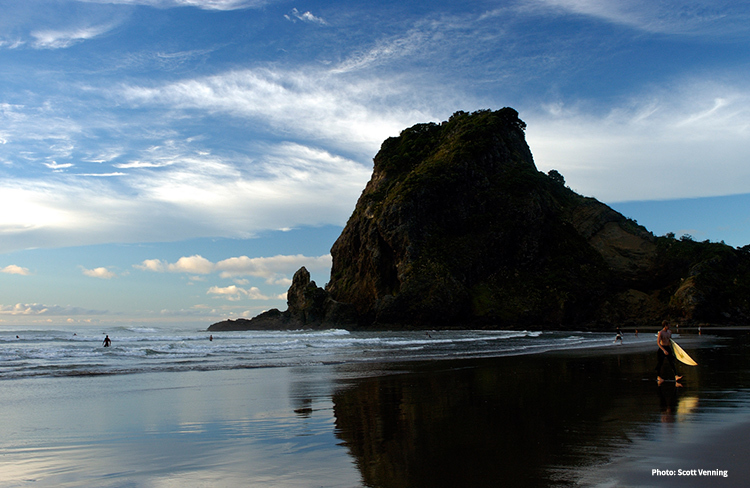 Like Piha these beaches are also known for great surf, so grab a board and take on the waves! Surfing schools and rental shops around the beaches are the perfect way for first-timers to learn, and what better place to learn to surf than on a black sand beach! Even without getting wet, these beaches are stunning to look at. The sands shine like glitter reflecting the sun, leaving tiger fur-like patterns on the beach. 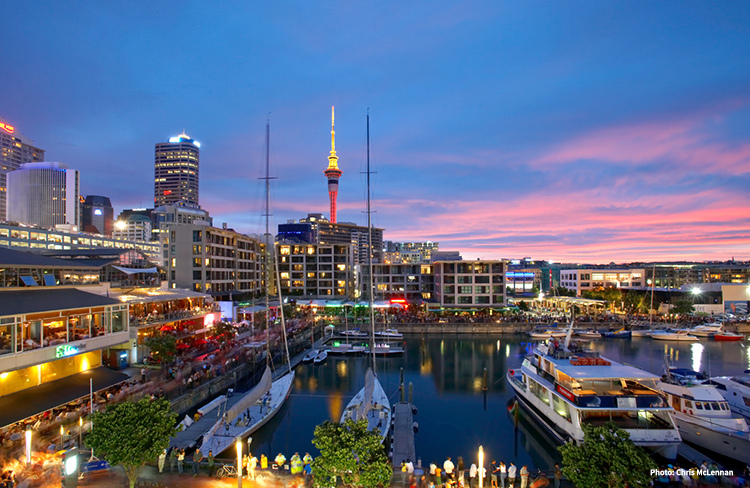 At the heart of Auckland’s CBD is Viaduct Harbour, the place where the City of Sails gets its name. 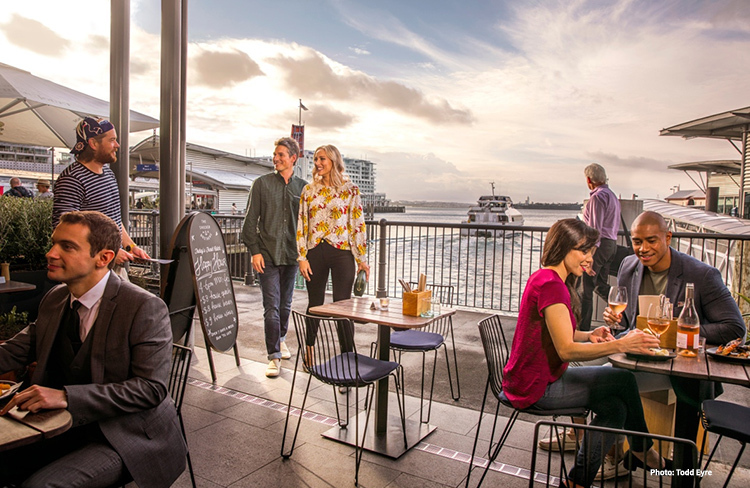 Boasting some of Auckland’s finest restaurants and bars, there’s no better way to sip on fine wines and enjoy mouth-watering cuisine as you overlook the waters and buzzing atmosphere around you. Spend a sunny afternoon or calm evening exploring the coffee shops, ogling the docked luxury yachts or even indulging in a cruise along the harbour. Step into New Zealand’s Voyager Maritime Museum or grab a gelato and take in te gorgeous views of the harbour. Don’t forget to grab a souvenir! The fabulous Maori portraits by artist Gottfried Lindauer alone are worth the visit to the Auckland Art Gallery. Housing over 15,000 artworks showcasing different periods and styles from international, New Zealand, Maori and South Pacific artists, it is the most extensive art collection in New Zealand. Lindaeur’s portraits are an enduring favorite, accurately depicting Maori people and chiefs with their unique facial tattoos, clothing and weapons. With short films, modern installations and traveling exhibitions, the gallery is a must for art lovers looking to delve deeper into Maori art. Complete the day with a coffee from the gallery cafe and a unique treasure from the gift shop. 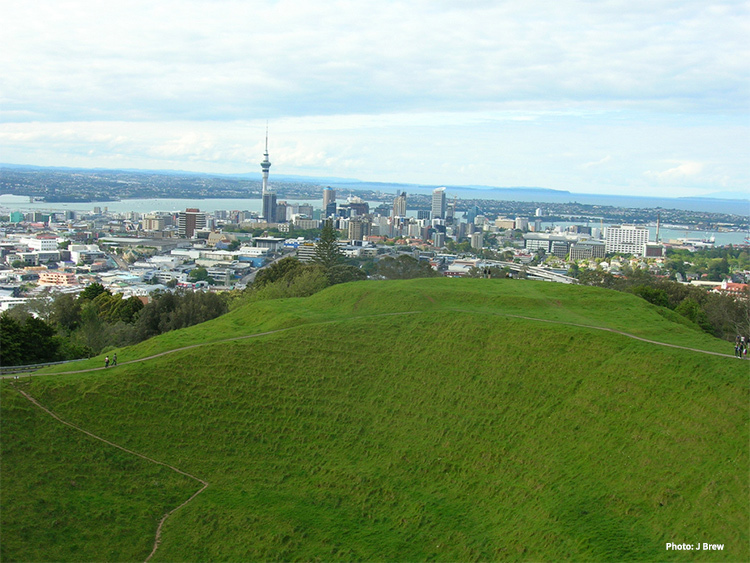 With 48 volcanic cones dotted across the city, these smooth, green-clad volcanoes are part of what makes Auckland’s landscape so unique. Rich in history and bound with spiritual and cultural significance, each of Auckland’s volcanoes have a story to tell. From Rangitoto across the Hauraki Gulf to Mount Eden – Maungawhau and One Tree Hill – Maungakiekie in the mainland, Auckland makes climbing a volcano an easy tick off your list. Mount Eden features three large craters with traces of pa terraces and food storage pits still visible, once used by the Maori. The deepest crater, named Te Ipu-a-Mataaho meaning The Bowl of Mataaho, is named after a deity said to live inside it, guarding the secrets of the Earth. The peak of Mount Eden is the highest natural point in Auckland, a popular destination with locals and tourists alike for sweeping views of Auckland right from the heart of its volcanic landscape. Explore a world of flavors in one of Auckland’s many growing food and wine precincts. From farmers markets to cooking glasses, islands of wine to harbor-side dining, you’ll find something to suit every taste. Find some of Auckland’s hippest cafes restaurants and bars at the Britomart district. Settle in for a seriously good roast at a cozy coffee shop, indulge at a dumpling bar or enjoy savory Mexican sharing plates. Stroll through the Federal Street district and discover a number of bars and restaurants headed by internationally renowned chefs. This foodie hotspot boasts freshly shucked oysters at Depot, Spanish tapas at Bellota and authentic contemporary Chinese cuisine at Huami. Grab a pint of carefully crafted beer at 16 Tun in the Wynyard Quarter waterfront precinct or a smooth glass of wine at Viaduct Harbour. With so many sensational restaurants, bars and hidden gems, it may be difficult to navigate Auckland’s food scene as a first time visitor. One of our favorite small-group tours excels in showcasing the best of Auckland’s food and wine hotspots for a local’s taste of Auckland. Don’t just gaze wistfully at the yachts docked on the harbor – join a cruise! As one of the best ways to take in Auckland’s main sights and surrounding islands, a cruise is the perfect way to experience this harbor city. One of our favorite cruises sets off from the Viaduct Harbour with the Auckland skyline behind you. Glide past the Auckland Harbour Bridge, the Devonport precinct, the Bean Rock Lighthouse and Bastion Point. Your skipper will provide entertaining commentary and history of the landmarks as you pass them by. Cruise past Rangitoto Island, the tranquil Browns Island, and picturesque Motuihe as you savor a delicious lunch. Want More Ideas for Things to Do in Auckland? Auckland is the perfect first stop on your New Zealand trip. We’ll make sure your visit is filled with the best things to do in Auckland and bucket list items. Let’s begin planning your journey! I Want to Visit Auckland! Our trip to New Zealand was amazing! (...) thankful for the opportunity for our family! YOU CAN'T TAKE A BAD PICTURE IN NEW ZEALAND! We LOVED our New Zealand trip!!!!! It was the most gorgeous place we've ever been...the mountain scenery is amazing....the Rotorua geothermal area was amazing.... the entire country is AMAZING! (...) of highlights of our trip.